Ric Hall has submitted the following story of how policing runs in the family. Way back in the day when I was the Drill Instructor in “Depot” Division, I had the occasion to meet Constable Al Malcomson (Reg # 33667) while he was in basic training. After I retired from the Force, we reconnected and he has since forwarded to me some unique stories. In one of these information exchanges, was as follows: Al forwarded me a photograph of his grand dad John Mills on his mom’s side. 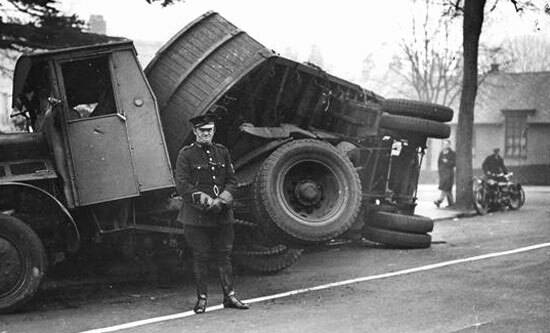 John was a career police officer with the Gloucester Constabulary and served from about 1923 to 1955. 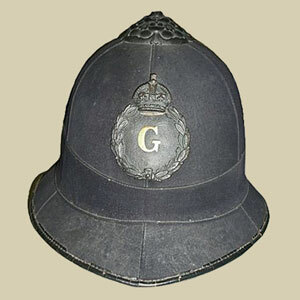 Photograph of Constable John Mills of the Photograph of an old helmet for the Gloucester Constabulary (Source of photo – Ric Hall’s Photo Collection). This picture was taken when he was on motor cycle traffic detail and he was likely working out of Stroud in Gloucester County. The picture was taken about 1927 before Al’s mom was born. He also took Al to the local police station and he got to see the jail cells with stone walls, iron bars and straw tick mattresses. He actually was very close to Al as he was his first grandchild and he would often make Al the neatest toys…Noah’s ark with all the animals, a water tower for his train set and a station to boot. His garden was complete with hollyhocks and scarlet runner beans. He even made a kite out of cloth and wood and it flew beautifully. He said goodbye to Al at the station when his family caught the train to Liverpool on their journey to Canada in 1954 and Al never saw him again. He knew that Al was joining the RCMP before he died. He was a real gentleman. He was related to John Mills the actor and his dad would have been the actors uncle. He would not leave England even to visit us in Canada. Al was astounded and learned that this other guard had grown up in the same village as his mom and had gone to school with her. He knew Al’s granddad well and related how they hid once under a bridge while my granddad patrolled on foot on top looking for them as they had been involved in some sort of mischief. The click of the blakies on his boots sent shivers down their spines. The man was John Spring and he was a detective with Matsqui for twenty five years and had just retired from that Force.